Experiencing the beauty of the Northwest with a couple, their daughter and sometimes their dog. As I sit here writing this blog in my office (don’t tell my boss), I marvel at how something so simple as reading a book can change the course of your entire life. In a classroom about 150 yards from where I sit, I was asked to read Ernest Hemingway’s For Whom The Bell Tolls. It was one of four books we read that quarter in The American Novel: 1910-Present. We also read William Faulkner’s Light in August, John Steinbeck’s Grapes of Wrath and Margaret Atwood’s The Handmaid’s Tale (which in hindsight is odd, since she’s Canadian, but I digress). Anyway, I was a religion major at the time. Once you stop laughing, we’ll get back to the story. That class taught by my eventual mentor Dr. Grinder helped open up a whole new world of reading and writing to me. I’d always read a ton, but had never been encouraged to pursue writing before. At the end of the quarter I switched majors and the rest is history. I became an avid Hemingway, Steinbeck and Faulkner fan, eventually adding Kurt Vonnegut Jr. to my canon of American authors who inspired me. 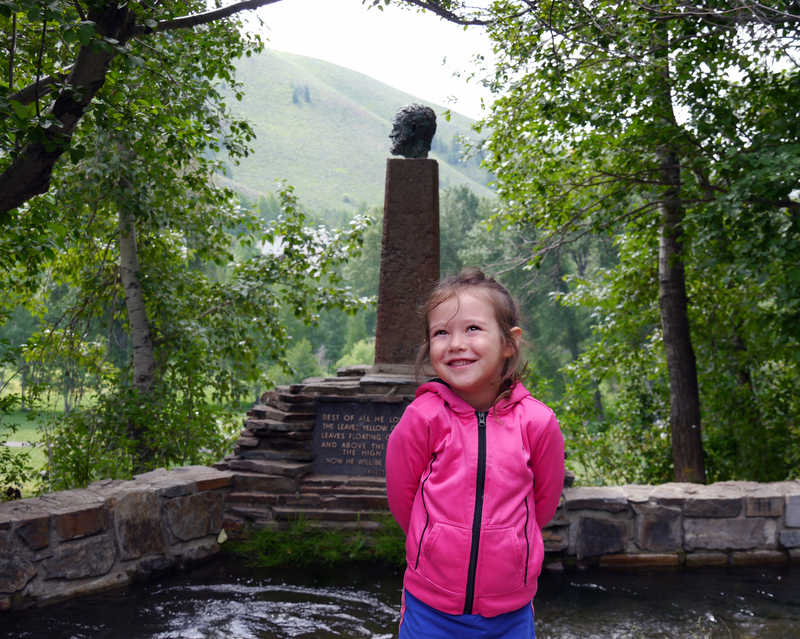 Cat hamming it up at the Ernest Hemingway monument in Ketchum, Idaho. Every summer I try and read Hemingway’s Nick Adams Stories because I love the imagery of Adams wandering the Michigan woods fishing, camping and just generally enjoying lazy summer afternoons. Hemingway, for all of his faults, knew how to paint a picture of the outdoors. Going to college in Idaho and living here two separate times has meant that Sun Valley has always been on my radar. Ketchum, Idaho, is important to Hemingway’s life story. Not only did he kill himself there, but he wrote large parts of For Whom The Bell Tolls in Sun Valley and I’m sure some of his outdoors writing was inspired by the fishing and hunting in the region. So to say I built up a Hemingway tour in my head was a big understatement. The vault at the Starbucks, featuring Hemingway history and photos. Unfortunately, it was just as big of a letdown. You don’t have access to his home because rich people don’t want traffic nearby – no matter that his home was there long before they moved in. 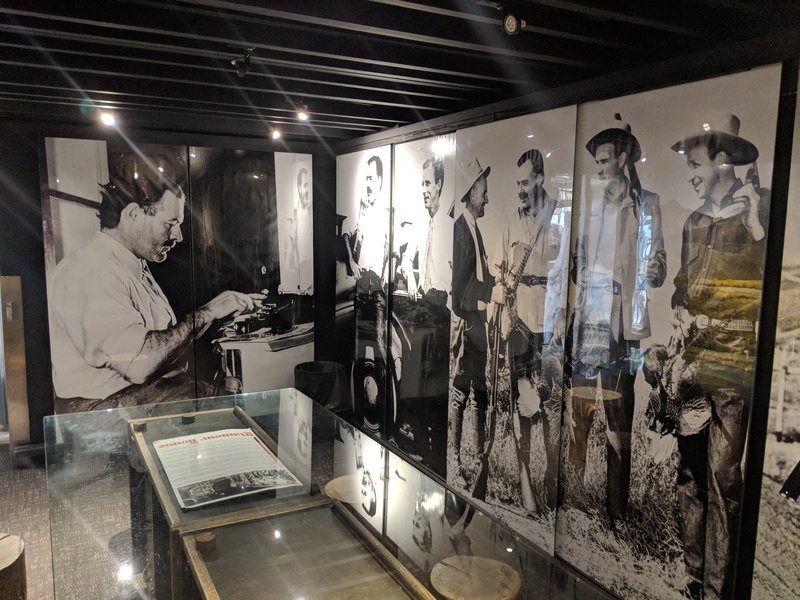 The standing exhibit dedicated to Hemingway located in the Ketchum library is only open Wednesday-Saturday. We were in town Sunday-Tuesday so we missed it. The main draw is his grave, which was kind of cool to see despite my 5-year-old daughter Catarina trying to steal a coin off of it. I love cemeteries. I go out of my way to see them on road trips so it surprised me a bit how little I cared about this one. As my mom likes to say, it’s just a body in there nothing else. It was a good reminder that while it was cool to see the scenery that helped shaped Hemingway, it’s probably better just to continue to let his memory live on through his written words. 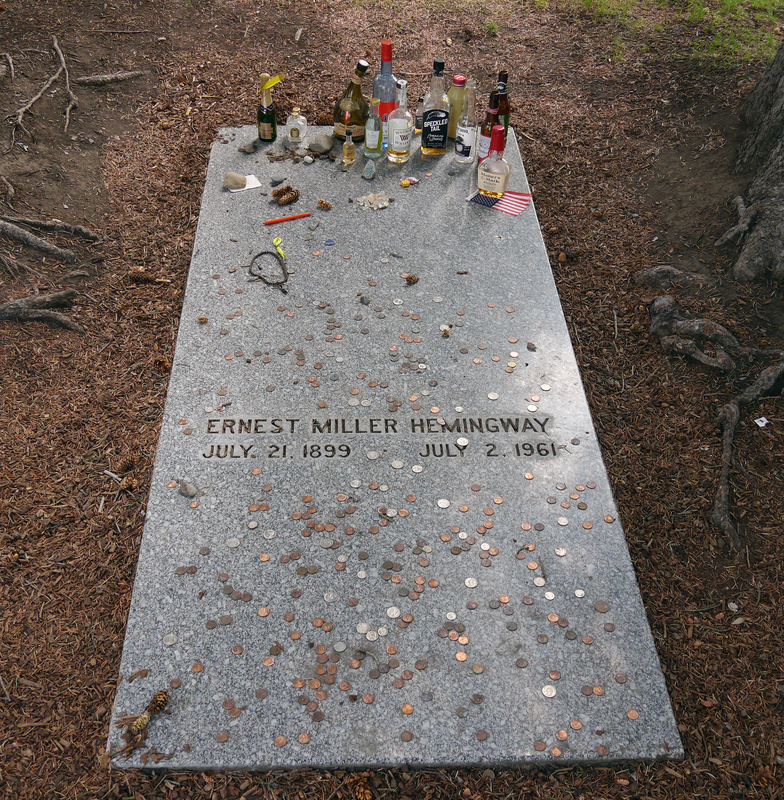 Ernest Hemingway’s grave in the Ketchum Cemetery. I did enjoy the statue that friends of his had constructed, overlooking a peaceful river valley (that now features a golf course and a bunch of mansions). We also visited the Silver Creek Nature Preserve, where Hemingway took his son, Jack, to fish when he was a boy. Also, the old bank vault that is built into the Starbucks is neat and features some cool wall-sized photos of the author with his friends. While my trip down Hemingway memory lane wasn’t all it was cracked up to be, I guess I should still be thankful for his novel that led to me sitting in this office chair 19 years later. Thanks son for opening a bit more of your story to me. I’m glad you took that class and found your place in society. Your writing is an inspiration and your reflections are always of interest to me. I look forward to a day when you can take me to some of the places you have discovered.